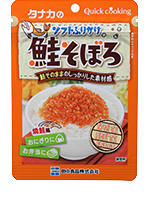 Soft and moist well selected minced chicken with plenty of Umami with ginger to improve its taste. It's best for boxed lunch. For warm rice, rice balls and bento boxed lunch. Zip up a bag to store in the frige after opening and consume it as early as possible. Tasty minced Salmon in Hokkaido. Its salted salmon tastes go with rice well. It's best for boxed lunch. 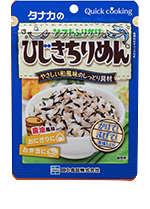 Making good use of the flavors of Hijiki seaweed and dried small sardine to make moist and soft Furikake. Plain taste of Soy sauce. 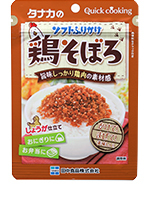 Furikake with the refreshing taste of crispy ume plum. 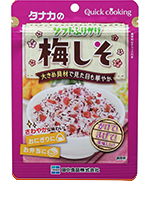 Soft coloful Furikake with savory ume plum. It's best for boxed lunch. Copyright(c)2014.TANAKA FOODS CO.,LTD. All Rights Reserved.